The original article in the Inquistr is here 500-Year-Old Prophecy By ‘Italian Nostradamus’ Comes True, Sparks Fears Of Supervolcano Apocalypse. Of those, only Bustle does a slight debunking - they couldn’t find the primary source for the “prophecy” and remark that the only sources are from tabloid newspapers that run end of times prophecies regularly. So anyway let’s do a proper debunking: First, apparently, it is true that Salento has had two days of unusually thick levels of snow. Video from the article. "But the fears have intensified into near-panic after two consecutive days of snowfall occurred in Salento, a peninsula in southern Puglia, Italy, where, according to residents, “it never snows.”"
It snowed heavily for several days in January 2015 just two years ago. Photos here including a snowman, and a photo of their dog in deep snow. They say there that it was the first time in 30 years. 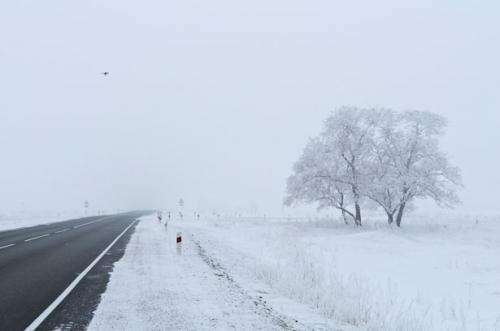 So do two heavy snowfalls in three years mean anything? To find a warmer winter you have to go back to 1869. and that was only 0.1 C warmer. And no other winter has been so warm back to 1659 - that’s for central England which has the longest continuous temperature record in the world. “The latest end of month statistics show it was provisionally the warmest winter for England and Wales since the record series began in 1910, while it was the third-warmest for the UK as a whole. The warmth has been most notable in the south of the UK with mean temperatures across much of the area more than 2C above average. Paradoxical as it may seem, it’s part of the same pattern. We may get more of this as the world continues to warm very slightly. So, to have occasional snow storms unusually far South in a slightly warming world is no surprise at all. But as it turned out, it's not even unusual for Salento :). On the icon, this is the icon that allegedly cried. See how it is damaged around the left eye? If you believe it is a miracle - well - maybe she is crying about the death of a sparrow? So on that, first, why would two days of snow in southern Italy mean that a volcano is about to erupt? It doesn’t make any logical or rational sense. It is just a “sign” which basically seems to mean that if you notice something odd anywhere in the world, that it is taken as evidence that some other unusual hypothesis that you happen to find scary is more likely to happen even if there is absolutely no causal connection between them. Nonsense! Why would that be the case? So they are possible. They are amongst the most likely of these devastating scenarios, though that still doesn’t make them that likely. Those statistics make the chance of a supervolcano before 2100 about 1 in 10,000. So 99.99% certain it won’t happen before 2100. I cover it in detail here: What really happens if Yellowstone erupts as a supervolcano, or if some other supervolcano erupts? The worst supervolcano in recent times was the one that created Lake Toba in Indonesia about 75,000 years ago. It’s 100 kilometres by 30 kilometres, maximum depth 505 metres. Its ash covered Malaysia to a depth of 9 meters, there’s an ash layer from it in central India that’s still 6 meters thick today, and ash from it is detected as far away as Lake Malawi in East Africa. It injected 2500–3000 km³ of debris into the atmosphere, and probably killed 60% of the human population worldwide, mainly through climate change impacting on their food supply. That’s the picture generally, that the main effect is through global climate change, which reduces the temperature globally by about ten degrees C for a decade, together with the direct effects of the deposits of ash on their crops. A large supervolcano like Toba would deposit one or two meters thickness of ash over an area of several million square kilometers. (1000 cubic kilometers is equivalent to a one meter thickness of ash spread over a million square kilometers). If that happened in some densely populated agricultural area, such as India, it could destroy one or two seasons of crops for two billion people. So yes it can be very serious. We can prepare for it though. With two years warning we can do large scale tests to work out what are the best crops to grow during the event. Also store crops that are currently used to feed cattle or for production of ethanol, for human consumption instead, which would be enough to give us a buffer for the first year. In that way we would be able to avoid perhaps all deaths from starvation, so impact would be far less than it was for early man. More about this here What really happens if Yellowstone erupts as a supervolcano, or if some other supervolcano erupts? Well if you read the story - yes this is a supervolcano. It formed the Campi Flegeri caldera 39,000 years ago. But the study only predicts a possible ordinary eruption, not a super volcano eruption. The article is here and open access for anyone to read. But it is written in techy scientific language so you need to know how to read that sort of stuff. So here is a summary of what they say in the Discussion section. I haven’t done anything here except to rewrite it in non technical terms plus I’ve only “translated” the most relevant sentences. Their model fits an increase in hydrothermal activity and from this they deduce that it is getting warmer. Their model suggests that this warming may be due to addition of water derived from magma. They can’t deduce any structural effects using their model but they notice that the caldera has raised in synchrony with their model’s hydrothermal temperature increase so suggest that the magmas they are studying may contribute to that effect. But they caution against using their model for prediction at this stage, because the process can be non linear. For instance in the case of Yellowstone then the rate of uplift in 2004 - 2008 accelerated, but then it decelerated. In the case of the Campi Flegeri caldera then it had a pause of ground uplift between 1982 - 1984 and in 2005. In other words despite all the dramatic reporting of this paper, all they were saying is that this mountain might or might not erupt, and that it needs more monitoring to see what happens, and they were just discussing an ordinary eruption also. As for prophecy well - that is just some person saying they think something is going to happen. Would you rely on prophecy to decide whether to carry an umbrella tomorrow? I’m not sure why so many people think that prophecy is of any relevance at all to whether or not a supervolcano will erupt. And if prophecy worked, why aren’t all the winners of state lotteries prophets? I can’t even remember hearing any story about someone who says they prophesied the winning numbers and so won that way. It's on a social media site from 2012 and doesn't give any sources. If you know any more do say! Hope this helps some of you be a bit less scared of this! None of the news sites except Inquistr mention that Disclose.tv is the source of the story as far as I can tell and none of them mention that the origin of the story is a site that is known for publishing fake news. Inquistr doesn't say anything to suggest the site is not one to be used as a trusted source. This new story was so widely and uncritically reported that I think it is quite a good test to weed out the papers that run stories like this. I was able to show that it was based on a site that publishes fake news in a few minutes of googling. Surely any journalist worth their salt could have done likewise easily if they had tried. So, I'd say, these are all news sites you can now cross off your list of reliable sources for stories of this nature. All of these: Inquistr, Au.com, Sun, Daily Mail. Cosmopolitan , Daily Star, Metro Magazine, East Coast Radio , WBNews, Yahoo7 News, RT, BT.com, Bustle along with any other news site that runs this story clearly doesn't have a policy to require that their journalists have to check to see if the original source is a site known to publish fake news, as none of them mention this fact. Bustle gets a half pass here by saying that it originates in tabloid newspapers but they did not pick up on the original source as disclose.tv. I have just started to compile a list of all the fake news stories for 2015 and 2016 that I know of. They run at several a week at present. I don't know if the numbers have gone up, or if it is just because I now get more people contacting me, scared, every time one of these stories break. I expect the list to go over 100 when finished. And it is very very rare to have a debunking story in mainstream news. I only know of two debunking stories so far for the last two years out of numerous doomsday stories. This is a major problem I think. It's hard to say how many there are who get scared about it. But I get on average three comments a day about it on my articles here, and a similar number of pm's a day. Often by really scared people, often they are seeing their doctor or psychiatrist or both to try to cope with their fear, and quite a few tell me they have felt suicidal. I get contacted by children from 14 upwards who have seen my articles and ask to be reassured that the world is not about to end and have had parents and relatives talking to me about younger children age 10 in one case and 5 in another (with that last one the children used tangerines over Christmas to explain to the adults why "Nibiru" can't hide behind the sun following a video I uploaded about it which I thought was rather charming :) ). So anyway - yes we can do something about it. Debunking articles help. Look at the flood of stories today about this doomsday. If you are scared by it, you won't find a single debunking article apart from my one, now that I've written it. WHERE TO FIND THE BOOK "DOOMSDAY DEBUNKED"
Read it online on my website (free). Some of you might also find Pocket useful - I've been suggested this by a keen reader of my posts. It lets you read articles offline without any internet connection. It's free (with a premium version which few people need). The kindle book may be useful if you want it formatted as a book, which you can read on your kindle, and also on most major smartphones, tablets and computers, using the free kindle reading app. All proceeds from the book will go to suicide prevention charities. At present the plan is to donate them to Befrienders Worldwide. If you buy it on kindle, then it also helps to put it into the best sellers lists there so others may find it too. Of the price of $3.99 for US customers, then $1.86 or 47% will go to charity, and the rest goes to Amazon. It's 70% royalties, but they reduce the royalties if you include graphics as a "delivery charge", and I felt it was important to have plenty of graphics. Where can I get support if I’m scared of Nibiru / Doomsday maybe even suicidal? I've made a new facebook group which you can join to discuss this and other doomsday stories that you find scary. also astronomers and scientists, do join if you want to help reassure scared people and help with the debunking. Please feel free to post any story you find scary, however silly it may seem. 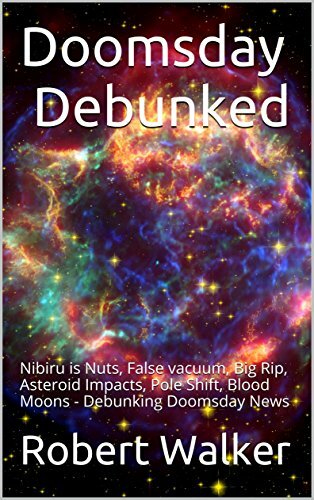 Also for astronomers and scientists - when commenting please bear in mind that some here may have decided long ago that astronomy and maths are not for them and others may be young children - children as young as 10 can get scared of Nibiru. Please treat any questions with respect. Ideas that seem LOL silly to astronomers can be truly scary to those without that background. Also you can check out my Debunking Doomsday blog which is where I first post articles like this. You are also of course welcome to talk to me, via the comments threads on any of my articles, and if it helps to contact me via pm you can contact me via my profile page on Quora. It is easy to join and then you should see an option there to message me. Particularly see my Debunking Doomsday blog where I do posts regularly to debunk the latest fake doomsday "news"
If you have any comments or questions do say. Also, if you notice anything that needs to be corrected in this article, however small, even a typo, be sure to say in the comments area, thanks.